With support for HomeKit and other connected home platforms, the new Philips Hue Bridge, in cooperation with the Philips Hue app, can relay control commands to a variety of electrical appliances via Siri on iOS. 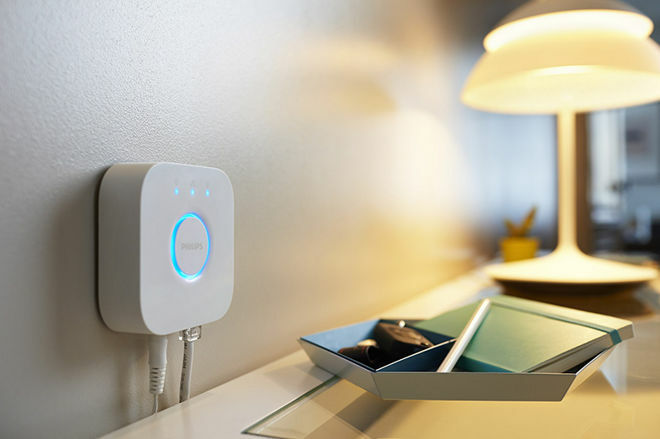 Users can also access connected devices away from home with the MyHue Web portal. "Lighting is the most accessible aspect of the connected home, and as the lighting expert for the Internet of Things we are taking connected lighting to the next phase," said Eric Rondolat, CEO of Philips Lighting. "By integrating Philips Hue with Apple HomeKit, we are broadening people's experience of light beyond what has been previously possible, providing seamless interoperability with other connected home devices." Integration with Apple's HomeKit opens the door to macros commands for simultaneous control of multiple devices connected to Hue Bridge. For example, asking Siri to "wake up" might turn on house lights, unlock the front door and switch on a coffee maker, while a entering "night mode" locks all doors and powers down active devices. In order to be considered HomeKit-compliant, hardware makers must install Bluetooth and Wi-Fi components certified by Apple, like Broadcom's Wireless Internet Connectivity for Embedded Devices (WICED) platform. More granular control schemes are also supported, as users can pinpoint particular Hue bulbs with on/off and dimming commands, switch "scenes" on or off in a particular room or control entire zones set up in-app. With support for more than 450 third-party apps, Hue Bridge can enrich home scenes with music, temperature adjustments and more. The new Hue Bridge is available in European and North American markets on Oct. 6.